In the bowl of a stand mixer fixed with the dough hook, combine yeast, salt, caraway seeds and 3/4 cup of water. Add the flours and combine until just mixed. Do not knead. Place risen dough in the refrigerator, loosely covered with plastic wrap, overnight or at least 2 hours. Remove the dough from the refrigerator and from the bowl, sprinkle with flour, and quickly shape it into a ball by stretching the surface of the dough around to the bottom on all four sides, rotating the ball a quarter-turn as you go. Elongate the ball into an oval-shaped loaf. Allow to rest and rise on a cornmeal-covered baking stone or parchment paper-lined baking sheet for 40 minutes. In the meantime, preheat oven to 450°F. Place a broiler tray on any other shelf that won't interfere with the baking stone/sheet. For the cornstarch wash: Mix cornstarch with a small amount of the water to form a paste. Add the remaining water and blend until smooth. Using a pastry brush, brush the top of the loaf with cornstarch wash and sprinkle with caraway seeds. Using a serrated bread knife, slash deep parallel cuts across the loaf. Place the bread on the baking stone/sheet into the oven, along with 1 cup hot tap water into the broiler tray. Immediately close the oven door and bake 30 minutes or until crust is a medium brown. Remove from oven and allow to cool completely before slicing or serving. Now that the holidays (and the gluttonous holiday eating frenzies) are over, it’s time to start fresh. For some, this means getting in shape and working off the excess calories they’ve acquired over the past months. For others, it means starting new things, from knitting to hiking to… baking, perhaps? This recipe is a great place to begin that resolution. Deli Style Rye is a wonderful recipe not only because the result is tasty, but the process of making it is simple. It’s an artisan loaf, meaning there’s no frustration when it comes to shaping the bread (it shapes itself, really). There are few ingredients, but they yield a wealth of flavor. Apart from a couple tricky steps in the preparation that aren’t difficult at all to overcome, this is a great recipe for first-time bread bakers – or bakers of anything – to try. I love rye breads because of their unique, savory taste, especially those with caraway seeds. I grew up on sandwiches made with caraway rye bread, so for me, I wouldn’t have it any other way. But if you’ve never acquired a taste for those crunchy seeds, omit them. You’ll still get a good punch of that classic rye flavor. Also, if you’re not a fan of the “artisan” bread shape and would rather make this into more of a sandwich loaf, be sure to shape and place the risen dough in a greased loaf pan rather than on a cornmeal-covered pizza peel. Just continue to follow the instructions accordingly and there should be no problem. 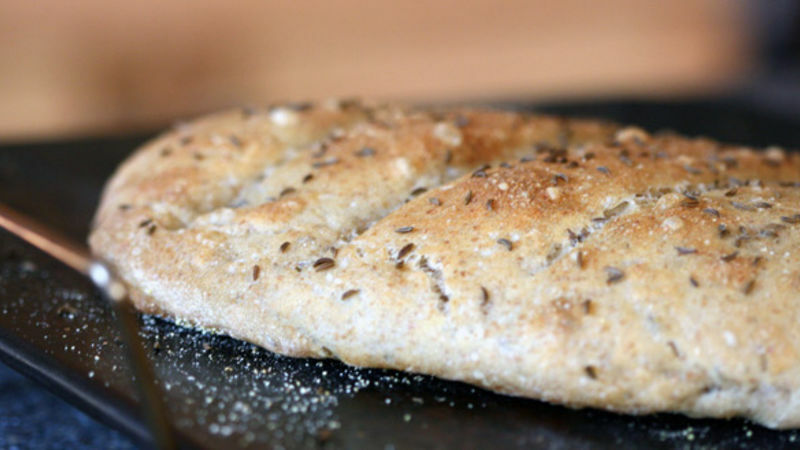 Finally, enjoy this healthy bread – even if you are on a post-holiday diet!